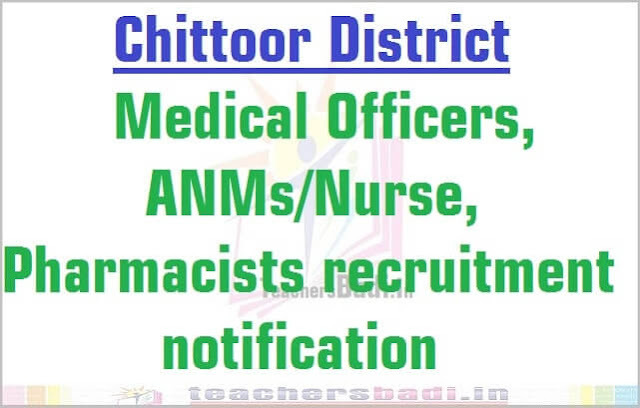 National Health Mission, AP, Chittoor District Medical Officer, Nurse, Pharmacist Posts 2017, Chittoor RBSK Staff recruitment notification 2017, Chittoor RBSK staff recruitment, application form, last date for apply, selection list, how to apply, eligibility criteria and selection procedure details given here. National health mission posts for Mobile Health Teams. National Health Mission, AP, Chittoor district health society has given the RBSK Staff recruitment notification 2017 and application forms are invited from the eligible and interested candidates for the recruitment of Medical Officer, ANM and Pharmacist for Mobile Health Teams on contract basis under Rastriya Bala Swasthya Karyakram(RBSK). AYURVEDA: Must possess a Degree in Ayurveda awarded by a University in India established or incorporated by or under a central act or provincial act or an institution recognized by UGC or any Statutory Board of the State Government after having undergone a regular course of institutional study in respective systems, both in theory and practice for a period not less than four and half years recognized by a University or state government with one year compulsory internship. UNANI : Must possess a Degree in Unani awarded by a University in India established or incorporated by or under a central act or provincial act or an institution recognized by UGC or any Statutory Board of the State Government after having undergone a regular course of institutional study in respective systems, both in theory and practice for a period not less than four and half years recognized by a University or state government with one year compulsory internship. HOMEOPATHY: Must possess a Degree in HOMEOPATHY awarded by a University in India established or incorporated by or under a central act or provincial act or an institution recognized by UGC or any Statutory Board of the State Government after having undergone a regular course of institutional study in respective systems, both in theory and practice for a period not less than four and half years recognized by a University or state government with one year compulsory internship. YOGA & NATUROPATHY : BNYS degree (or) a diploma in course in Naturopathy from Gandhi Naturopathy Medical College after regular study of 4 years or more, awarded by a University in India established or incorporated by or under a central act or state act or an institution recognized by the UGC or any statutory board of the state government. A) SSC B) Diploma in Pharmacy C) Registered with Pharmacy Council D) Computer skills. The recruitment is made on contract basis and the contract is initially for a period of one year and renewal will be as per the need and NHM yearly plan(PIP) and also subject to satisfactory performance. However, every year new contract has to be signed and valid for the period as indicated in the contract. Recruitment shall be done by the District Selection Committee for the Chittoor District Health Society. Notification has to be issued in newspapers by the District Health Society, Chittoor. 1. Total Marks are 100 of which 90 marks will be allotted basing on the marks obtained in qualifying examination and 10 marks will be awarded for the age. Weightage for age will be reckoned from 18 years of age of the candidate. 0.5 mark will be awarded for one completed year of age with a maximum of 10 marks. The age will be reckoned as on 1.7.2017. (Example 1. If a candidate completes 20 years as on 1.7.2017, he will be awarded 1.0 mark; Example 2. If a candidate completes 30 years of age as on 1.7.2017, he will be awarded 6.0 marks; Example 3. If a candidate completes 40 years of age as on 1.7.2017, he will be awarded 10.0 marks). 2. Merit list will be prepared based on the marks obtained with above criteria and displayed on website for transparency. Filled in application forms shall be submitted in person or through registered post to the Chittoor District Medical & Health Officers to the district to which the candidate is applying. Last Date for receipt of applications: 26.04.2017. 1. A person can apply for more than one districts. 5. Registration certificates of respective councils.